Hybrids are nothing new I know, but here we have a couple of new models which looks rather strange and dapper I am sure you will agree. First we have those crazy cats from the Merc Trainee school where around 150 students have been working on the concept for about a year. 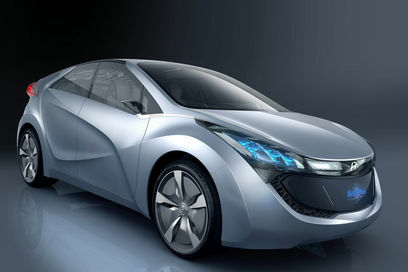 We then have a more likely Hyundia Blue which in theory could change the way hybrid are made, with promises of ultra low CO2 emissions and fuel economy of well over 100mpg. 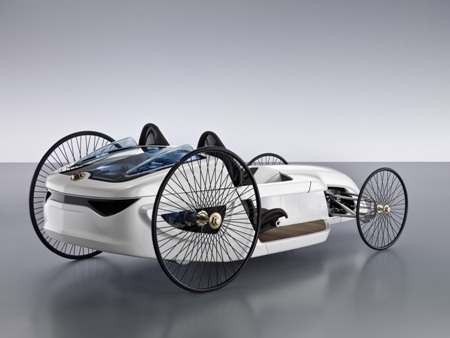 The Mercedes-Benz F-CELL Roadster has been developed over the past year as a concept study by more than 150 trainees and dual education system students. Although you eyes are immediately drawn to those large spoken wheels that fell of my great-granddads penny farthing, this concept goes much, much deeper. 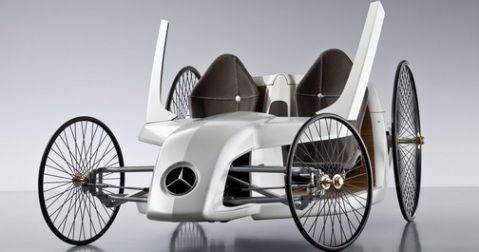 The wheels, based on the 1886 Benz Patent Motor Car are complemented by carbon-fiber bucket seats, hand-stitched leather covers and fibreglass front, based on an F1 car. The power comes by the way of an emission-free fuel cell system, that develops an output of 1.2 kW and reaches a staggering 16mph… Hang on, 16mph? Apparently so! Don’t worry though you have a range of 218 miles on a single charge so that’s a whole 13 and a half hours of driving pleasure…..
Hyundai is also going along with the hybrid concept models and will release details of it’s advanced hybrid for the Seoul Motor Show in April. Know, as the blue-will, the eye-catching bodywork houses a plug-in petrol-electric powertrain that is rumoured to provide ultra low CO2 emissions and fuel economy of well over 100mpg. It uses a 1.6-litre direct-injection petrol engine, that only switches on to top up power levels in the lithium Ion Polymer batteries which provides the cars usual power. The motor produces 134bhp which is pretty impressive given the type of car. Add to this headlight covers made from recycled bottles, and interior components plus engine cover made from biodegradable plastics, along with the roof solar panels and you have one green machine.